By March 2013, 10 government-owned infrastructure companies would issue Rs 53,500-crore worth of tax-free bonds. Interest income earned from this bond will be tax free. 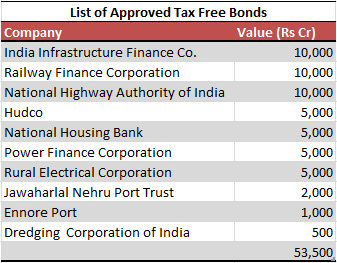 List of approved company for issuing tax free bonds are given below. These bonds are called as tax free as Interest received from these bonds will be free from income tax and won’t be part of any income. Out of this Power sector lender Rural Electrical Corporation’s (REC) is issuing 4,500-crore tax-free bond on 3rd December, 2012, This brings an opportunity for investors to lock in money at higher yields and earn tax-free interest income. So let us discuss it is better to Invest in REC tax free bond or one should look for other fix income instrument like fix deposit? REC tax-free bond is distributed under two series of 10 years and 15 years, offer coupon rates of 7.22% and 7.38%, respectively for institutional and high net worth investors (HNIs). • Issue Open Date – Dec 03, 2012. • Issue Close Date – Dec 10, 2012. • Min Application Amount – Rs 5000/- Or o5 Bonds. • Credit Rating – AAA By CRISIL, ICRA, CARE. • Mode Of allotment– Demat as well Physical mode as opted by the investor. One can buy and sell these bonds on the stock exchanges. 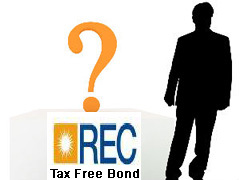 Though the interest earned on these bonds is tax-free, any capital gain from sale in the secondary market is taxable. Tax-free bonds are rated long-tenure (usually 10-15 years) fixed-income securities offering annual interest at rates less than the yield of government securities of similar tenure. At present, 10-year government bonds are trading around 7.22%. Going by these rates, one can expect the interest rate to be 7.5-8%. Now a day’s most long-term fixed deposit rates settling in the 8.5-8.75% range, investors looking for fixed-income instruments usually invest in fix deposit. But remember that interest earned on bank FDs and other normal bonds are added to the income of the investor and taxed as per the income-tax slabs. Higher the tax slab lower is your return. Means Post-tax return from an FD that offers 8.5% annual interest would be 5.9% for an individual in the 30% tax bracket. You invest 10,000 Rs/- in Fix deposit of SBI for 1 year with current rate of interest 8.5 %. On maturity you will receive maturity amount 10,850 Rs/- for interest compounded annually. For Tax Bracket of 10% effective maturity amount after deduction of 10% from interest income will be 10,765 Rs/- this will bring effective annual interest to 7.6%. For Tax Bracket of 20% effective maturity amount after deduction of 20% from interest income will be 10,680 Rs/- this will bring effective annual interest to 6.8%. For Tax Bracket of 30% effective maturity amount after deduction of 30% from interest income will be 10,595 Rs/- this will bring effective annual interest to 5.9%. So if we compare tax free REC bond to fix deposit than tax free REC bonds is a good bet for only those who are in 30% tax bracket.